What Does it Mean to be a Master Pool Contractor? When you make the decision to install a new swimming pool, you should make sure that you hire a licensed contractor with years of experience and creativity. You want to make sure that you have access to the highest quality products and materials and you want a crew that uses cutting edge technology. These criteria should be followed when picking your new swimming pool installation company. If you have decided now is the time to build a swimming pool, choose a Master Pool Contractor who is a member of the Masters Pool Guild, an international trade organization that ensures a benchmark for quality and experience. Its members adhere to a common code of ethics that ensures fulfillment of promises and a guaranteed level of integrity in materials and service. The Guild is an elite membership; generally only one member is invited to represent a given region. 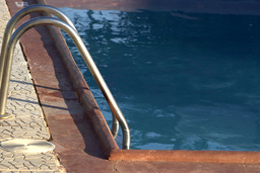 Some pool contractors are not experienced in all aspects of design and installation. You should take care to choose a builder who is eager to prove to you that he is committed to helping you realize your vision down to the last detail. Always take the time to look at a designer’s portfolio of previous projects and ask for references. Then, be sure to follow up. A pool, after all, is a sizeable home improvement project that can cost you untold thousands of dollars in cost overruns and shoddy construction if done by an unqualified builder. The best pool contractors will offer free estimates on your proposed design, and explain pricing and options in depth. There are so many swimming pool options available, and a master pool contractor will explain the costs and benefits of each. You should do your research on what type of design you are looking for before you start shopping for contractors. You do not need specifics, but knowing what you are looking for can help make the process run more smoothly when you decide on a designer. For example, you may want to see if you want a concrete pool with your choice of finishes and accents, or if you want a pool with a liner. Both options have their pros and cons and you can ask your contractor about these when you meet. If you wish to spend a lot of time outdoors and use your pool frequently, ask about such water features as a slide, a fountain, a waterfall, wet bar, fire pit, handicapped access, or an outdoor kitchen and dining area. A pool can be customized for just about any use, and, in fact, it should be. A Master Pool Contractor in Raleigh Durham can create a pool based on your unique needs or a more conventional design that adds to the overall resale value of your property. Remember, installing a swimming pool should be exciting and fun and should be the result of open communication between you and your contractor. A Master Pool Contractor will encourage you to ask questions, keep you informed on the progress of your project, and handle any problems that arise swiftly and efficiently. This synergy is what results in an outstanding final product that you can enjoy for years to come. Gress Inc. is a master pool contractor that creates custom swimming pools in Raleigh, Durham, Cary, Apex, Greensboro, Wake Forest, Chapel Hill, Holly Springs, Fuquay Varina, New Hill, Pittsboro and Sanford.